In this post I will elaborate on something I’ve touched upon in the past. Previously I wrote a blog post called “Dealing with opposition when preparing an LGBT outreach.” This post was in response to a reader question I received. In my response to him I stated “For anyone who is considering or has considered reaching out to the LGBT community you must first weigh the pros and cons that are unique to your own individual business. I am a proponent of companies reaching out to the LGBT community in an authentic and transparent way. If you cannot do it in that way, then you shouldn’t be doing it at all. It may seem a bit harsh but it’s the truth.” I want to elaborate on this statement a bit. I created an online training course called Gay Sales 101:How to Sell to the $830 Billion LGBT Market. It is a training course designed to teach you everything there is to know about the LGBT community and how you can successfully market to it. I bring this up because as I was creating the training modules for this course a recurring theme kept coming up. 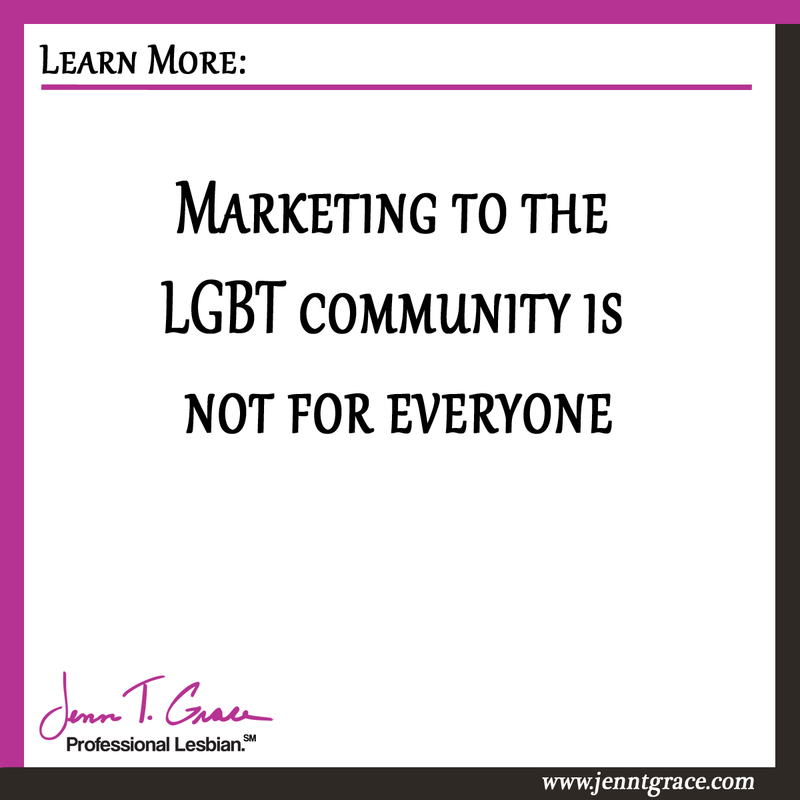 Marketing to the LGBT community is not for everyone. The more I developed this content and talked to people the more clear it became that you can’t fit a round peg into a square hole. I can’t emphasize this enough. For folks interested in my full online training course you must first make a commitment to yourself as to whether or not marketing to the community makes sense for you. You may think it sounds like a good idea in theory and then realize, oh wait, this isn’t for me. I am here to say that is okay if that’s what you decide. I talk with business owners each and every day and 9 out of 10 times when they are coming to me with questions and looking for coaching, I know marketing to the community is right for them. But every now and then that 1 out of 10 person comes strolling along and we mutually decide that this isn’t the right fit and honestly – there’s nothing wrong with that. I am here to teach you the authentic way to reach the community. I am not here to force you to think differently or have different beliefs based on the buying power of the LGBT community. The world needs more advocates, allies and champions for the LGBT community – not money hungry folks who are trying to make a quick buck from it. This may be a bit harsh but I want to drive the point home that I am 100% here for you if you want to make this leap. And if I have to hard sell you on why you should do it and you are still hesitant then chances are it’s not right for you – and that’s totally okay. Let’s not waste my time or your time, okay? 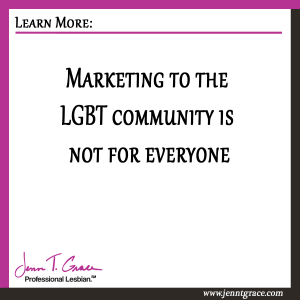 For those still reading, here are a couple of blog posts that talk about some of the things I’ve mentioned above that can help you decide if marketing to the LGBT community is right for you. What’s the buzz about the ‘gay dollar’? … and why you should care. As always, I’m here to answer questions should you have any! shout out from Houston Texas! Just wanted to say keep up the good work!